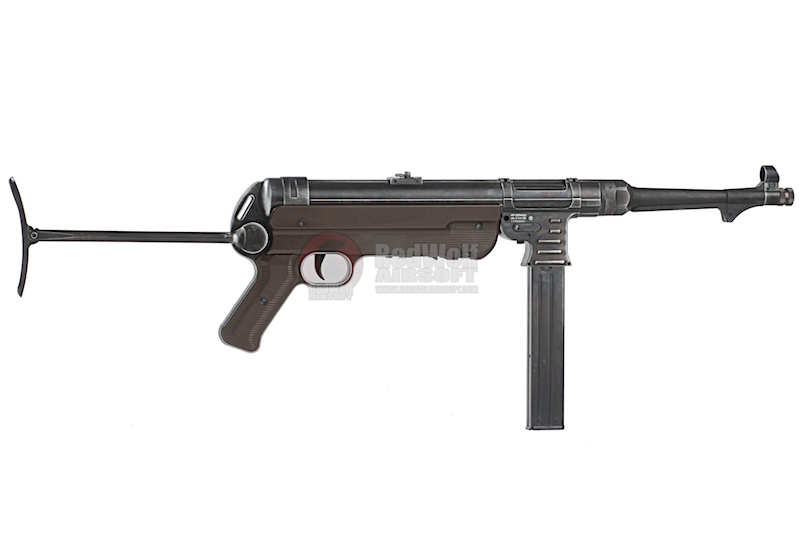 The MP40 is one of the most iconic sub-machine guns of all time. 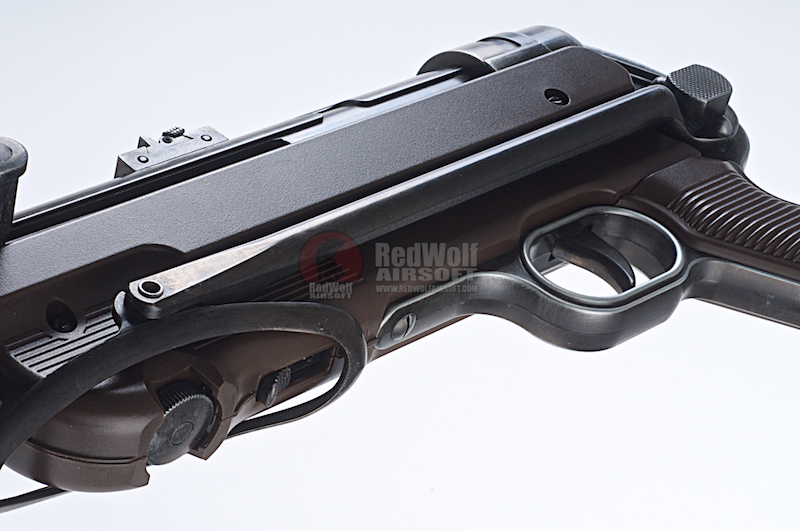 Apart from the plastic grip panels and the portion encompassing the lower receiver, everything else is made out of metal. The battleworn finishing of the metal is exquisite. The rear sight back here has two of them, one, which sits about 2mm higher, which you can flip up. The stock can be folded underneath. 40 round magazine where you insert two CO2 capsules in the base. 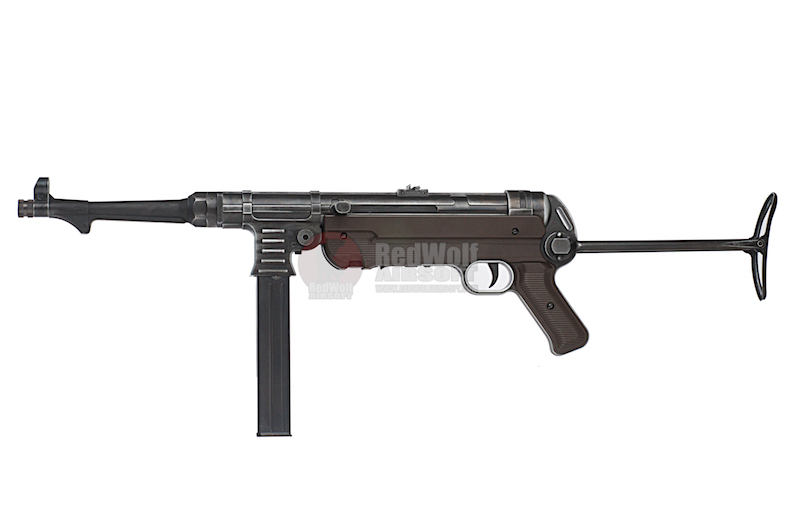 This version has that its real steel counterpart does not is that this MP40 can switch into semi auto mode. The MP40, one of the most iconic sub-machine guns of all time, had seen action during world war two meaning that you would have most likely seen it in basically all movies, all TV series, and all video games where WW2 was the main subject. Now apart from the plastic grip panels and the portion encompassing the lower receiver, everything else is made out of metal. Aluminium to be more specific, though the pins that keep it all together and the lower portion of the magazine is made out of steel. The finishing of the metal is exquisite. It looks as though it had purposely been worn down giving it character. It has also got a good weight to it. Mind you, it does weigh half a kilo lighter at 3.5KG and is a centimeter shorter than the real steel counterpart. At the front, you'll find a hooded front blade sight. The rear sight back here has two of them, one, which sits about 2mm higher, which you can flip up. The stock can be folded underneath, but first, you'll have to flip the shoulder rest back, press the button on the left side to release the stock and will eventually click into place. 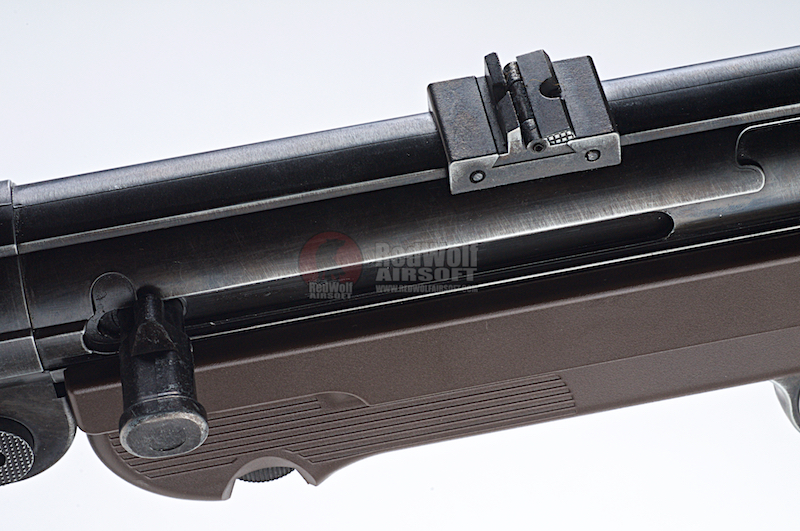 The magazine release can only be found on the left side, releasing a 40 round magazine where you insert two CO2 capsules in the base, one facing down and one facing upwards. Use a hex key to seal it tightly. One thing that this version has that its real steel counterpart does not is that this MP40 can switch into semi auto mode. The switch can be found underneath. 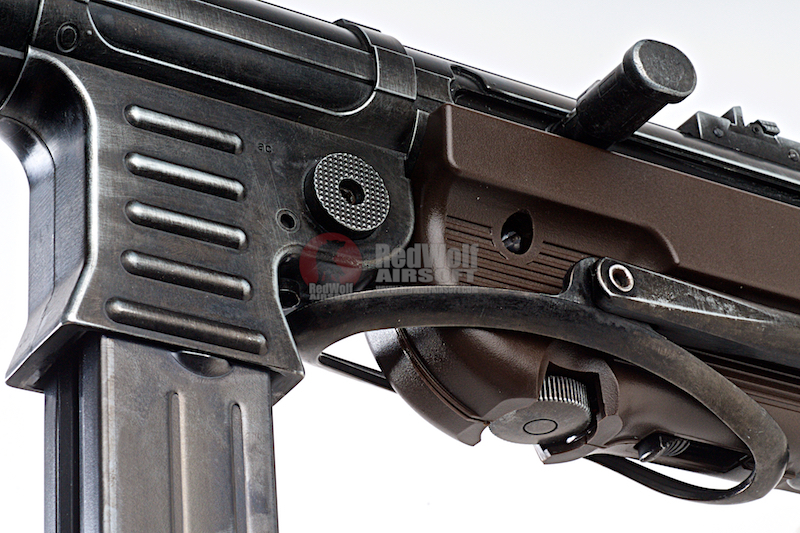 It's safe to assume that airsoft guns these days would come with a hop up adjustment dial. If it isn't in the breach, it's under the barrel towards the back. If it's not on the barrel, its internal. 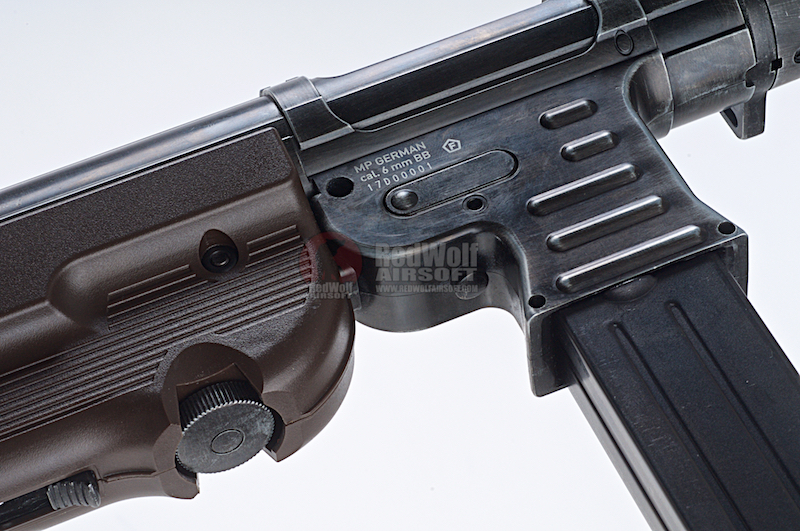 If it isn't internal, then maybe, just maybe, after many hours of searching, you then realize that this MP40 doesn't have a hop up adjustment dial meaning it has a fixed hop. Umarex GmbH & Co. KG is a German manufacturer of air guns, tear-gas and signal pistols, paintball markers under the RAM brand and airsoft guns, based in Arnsberg, North Rhine-Westphalia. The firm was founded in 1972.The United States subsidiary of Umarex is called Umarex USA and was created in 2006 after acquiring the United States marketers of the RWS brand (formerly part of Dynamit Nobel), which they continue to market. Umarex USA markets Umarex airguns in addition to many other airguns under license from various firearm brands that include Beretta, Browning, Colt, Hammerli, HK, Makarov, Ruger, Smith & Wesson, UZI, and Walther. Umarex USA entered the tactical rimfire market in 2009 with the importation of Walther-made Colt M4 and M16 .22 LR guns. The company has in-house brands including entry and mid-level airsoft guns in their Tactical Force and Combat Zone brands, while reserving their Elite Force brand for premium airsoft guns. 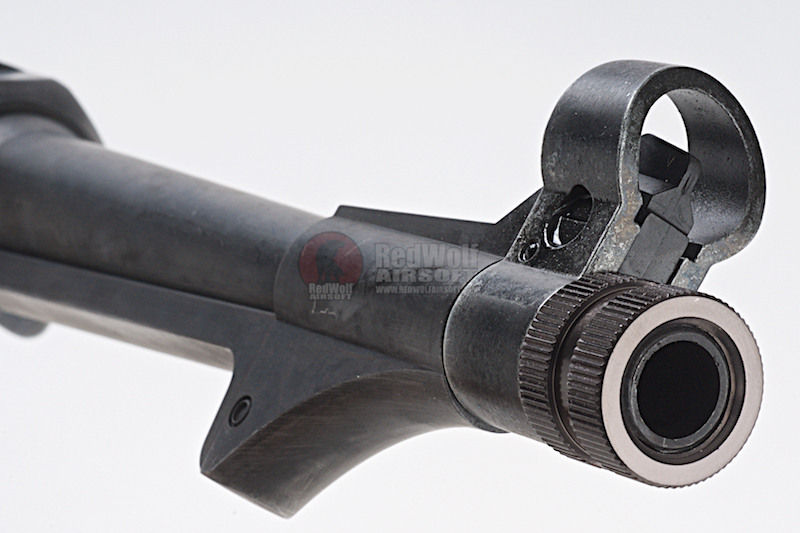 The Legends line is based on historical guns in a BB or pellet airgun format. In late 2010, the company began offering a Turkish-made M1911A1 chambered in .45 ACP under the Regent brand. x1 x1 Umarex Legends MP40 Co2 Version. x1 x1 40 Rnd Magazine.